Shah Rukh once said these words while he was speaking to young, impressionable students. But it isn’t just SRK who was lucky to turn his passion into a profession, we were all lucky to witness the meteoric rise of a man who came from a middle class household in Delhi and eventually became one of the most celebrated figures in the whole wide world. The early years of his film career are still fondly remembered by his fans and though we still enjoy watching him in all his glory, the magnanimity of Shah Rukh Khan, is much more than the characters he plays. Shah Rukh’s association as Raj or Rahul is probably the first thing that comes to the mind of anyone who has heard of the actor but is that all there is to him? With over 25 years in the film industry, Shah Rukh has done characters of various kinds but with time, his personality has grown much bigger than the characters he plays. His stardom is not dependent on his film roles anymore and that speaks volumes about the legacy he has built. Who knew that a young boy from Delhi who played Abhimanyu in a TV show would one day be honoured by the world for his artistic endeavours. With his films in the early 90s, Shah Rukh established himself as the hard working, sincere man whose eyes could make us smile, blush and also had the capacity to make us cry. Be it the timid Sunil from Kabhi Haan Kabhi Naa or the much loved Raj Malhotra from Dilwale Dulhania Le Jayenge, he made us root for the characters he played. Even when he was the man who sought vengeance for his family in Baazigar, we believed in his cause. His character’s morality was certainly questionable but the audience never wanted him to fail. There is no shortage of Shah Rukh’s critics and the most common criticism they have for him is "But he does the same thing over and over again." Of course, Shah Rukh has done a lot of similar characters in his career but even the critics would agree that his magic is infectious. Shah Rukh shot to immense fame with his characters of Raj and Rahul and while these characters are still adored, the stardom of Shah Rukh is not dependent on these characters anymore. In over 25 years, we have seen the man rise to the peak but we’ve also seen him fall down and through it all, we learnt that one’s success isn’t just measured by the hits and flops they give, it’s about the love that the masses have for them. In the past few years, most of Shah Rukh’s films have been criticised for the fact that they don’t make the audience feel the way they used to. Most of us still watch a Shah Rukh Khan film to watch him on the big screen. We still crave for the Raj who crossed oceans for his Simran, we long for a mentor like Kabir Khan and our dark sinister side still wants to see an anti-hero whose morality is ambiguous when it comes to his love. 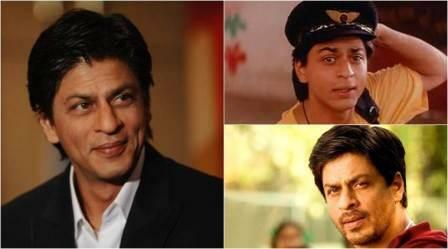 Shah Rukh has come a long way since those memorable years. Primarily, he is still an actor but his presence is not just bound to films anymore. Like many other celebrities, we can see his social media profiles to satiate our craving for his presence and we are immensely satisfied when we see him endorsing a product that we actually use but what bowls us over every single time is the way he speaks. Shah Rukh’s oratory skills can give some of the best politicians and motivational speakers a run for their money. His wit, his ability to take a dig at himself and his deep understanding of life all comes across in the way he holds his audience when his speaks. His recent TED talk was an example of the same. Those days of Raj and Rahul are somewhere in the past. However, we still look forward to every new film he does, every new stage he takes and every new tweet he posts because he still manages to charm us every single time. Some people come into this world to make it a better place and looking at the journey that he has had so far, we can indeed say that Shah Rukh Khan is the man who made this dull, mundane world a better place for us.